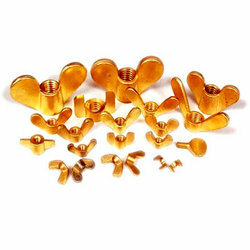 Manufacturer of a wide range of products which include brass wingnuts. We offer precisely engineered range of Light & Heavy Brass Wingnut. These nuts are used for various applications in variegated industries due to their optimum performance and longer working life. Sizes ranging up to M10 & 5/8 inches in stock, but can also be manufactured as required by clients. Looking for Brass Wingnuts ?